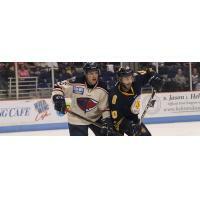 NORTH CHARLESTON, S.C. - Despite a putting up a season-high 52 shots on goal, the South Carolina Stingrays (28-29-5-1) came up short at the hands of the Norfolk Admirals (24-30-5-3) on Friday night at the North Charleston Coliseum, losing by a score of 6-3. The Rays' goals were scored by forwards Josh Gratton, Tad Kozun and Grant Besse, while Andrew Cherniwchan recorded his 60th point of the season with an assist and captain Joey Leach also registered a helper in his return to the Stingrays. Gratton got South Carolina in front right away just 1:40 into the first period, deflecting a shot by defender Ryker Killins past goaltender Ty Reichenbach to give the Stingrays a 1-0 edge at the start of the game. Forward Sam Fioretti picked up the second assist on the strike, his 15th helper of the year. Norfolk's Domenic Alberga tied the game at 1-1 while the Stingrays were on a man-advantage just over a minute later, scoring shorthanded. The Admirals then scored two more later in the first and had a 3-1 lead at the end of the opening frame after goals by Darik Angeli at 5:37 and Eric Roy at 16:10. Kozun got South Carolina back within one in the middle period, scoring the lone goal of the frame to make it 3-2 at 6:56 from Cherniwchan. The tally was the Nipawin, Sask. native's 15th of the year in his rookie professional season. But the Admirals got their two-goal lead back when Jake Wood scored at 6:51 of the third to make it 4-2 and then increased their edge to 5-2 on a tally by Connor Hurley that came at 10:03 of the final frame. The Stingrays' final strike came from Besse at 15:15 of the third and cut the deficit to 5-3, but Norfolk's Ben Duffy closed the scoring with a breakaway goal just over a minute later at 16:19. Besse's team-leading 26th goal of his sophomore campaign came with an assist from Leach. The final shots-on-goal tally was 52-42 in favor of South Carolina. Reichenbach finished with 49 saves to earn the victory for his team. The Admirals went 1-for-3 on the power play in the contest while the Stingrays finished at 0-for-4. A loss for the Stingrays combined with a shootout loss for the Atlanta Gladiators has the two teams tied for the fourth and final playoff spot in the South Division, even in the standings at 62 points apiece. South Carolina is back at the North Charleston Coliseum on Saturday night when they battle the Florida Everblades at 7:05 p.m. Tickets are on sale now!